What is humidity? Humidity is the amount of water vapor (water that has turned from a liquid to an invisible gas) in the air. Absolute humidity is the actual amount of water vapor in a specified volume of air. Relative humidity is the ratio of moisture in the air as compared to the maximum amount of moisture the air can hold, which varies depending on the air temperature. Hotter air, for example, can hold more moisture. Knowing the relative humidity indoors is important because humidity affects comfort, health, and the condition of household possessions. When indoor humidity is too high (above 55%), people tend to consider the room to be hot and stuffy even though the temperature may be at a level that is normally comfortable. When the indoor humidity drops below 25%, the dry air also reduces comfort. Keeping humidity in the optimal range indoors helps to control bacteria, viruses, fungi (including mold), allergies, and asthma. Humidity monitoring provides a way to check how well humidifiers, dehumidifiers, and air conditioners are working. Proper humidity control can also help with equipment performance and reduce energy consumption. Outdoor humidity also makes a difference in what a particular temperature feels like. It is more difficult for our bodies to handle hot weather when the humidity is high. While unfortunately, humidity control is impossible outdoors, knowing the relative humidity level can help us to understand how warm or cool the air will feel at a given temperature. Using a humidity monitoring device outdoors can also alert you to rain, snow, or reduced visibility. When the relative humidity is 100%, the air becomes saturated, meaning it can’t hold any more moisture at that temperature. If it cools down even a little, the air will release water in the form of dew on the ground, fog or mist in the air, or precipitation from the clouds. A humidity monitoring device is called a hygrometer. Hygrometers may be designed for indoor or outdoor humidity monitoring use (or both). Below is a summary of the types of hygrometers available for measuring humidity. Analog Hygrometers use a moisture-sensitive material that is attached to a coil spring. The spring controls a needle on an easy-to-read circular dial. 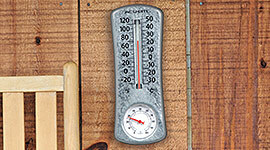 Analog hygrometers are often part of a durable, weather-resistant device that also includes a thermometer. The advantages of analog hygrometers are that they are generally inexpensive and simple to use. When combined with a thermometer, they provide useful information about the weather or indoor conditions at a glance. Analog thermometer-hygrometer combinations come in different sizes, shapes, and finishes to complement your decor. Sometimes analog hygrometers are combined with an attractive clock with humidity or a classic weather station that displays environmental conditions including relative humidity. The hygrometer dial on these types of hygrometers is typically marked to indicate optimal and problematic humidity levels. Analog hygrometers are not as accurate as digital devices. They generally measure to within ±10% accuracy. They also are slow to reflect abrupt changes in humidity, sometimes taking up to an hour to reach an accurate reading. While AcuRite hygrometers are individually hand-calibrated and typically should require no further adjustment, should you need to calibrate your analog hygrometer, it is important to follow the included instructions carefully. Digital hygrometers determine the relative humidity by using a sensor to monitor an electric current that is affected by moisture levels. They are often integrated into multi-function weather measurement devices, ranging from simple indoor temperature and humidity monitors to indoor/outdoor devices with multiple features. Digital hygrometers can keep track of high and low humidity measurements, historical data, and trends. They are more precise than analog hygrometers, with a typical accuracy range of ± 5%. Digital humidity devices do not require manual recalibration; some allow manual calibration for fine-tuning. Basic digital hygrometers have an LCD display that shows temperature and relative humidity, and they may include additional information such as optimal comfort ranges and daily highs and lows. Depending on the model, they may be mounted on a wall, set on a level surface, or even magnetically attached to the refrigerator for easy reference. Digital weather stations include an outdoor sensor that transmits data wirelessly to an indoor LCD console, making it possible to measure both indoor and outdoor humidity levels, along with other environmental and weather data. Digital weather stations may include a selection of features including the weather forecast, an atomic clock, and a moon phase indicator. 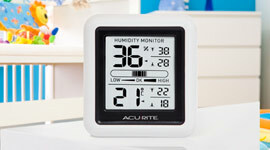 For easy indoor humidity observation, some AcuRite weather stations include a Humidity Level Icon, to easily indicate a high, low or ideal indoor humidity level. For outdoor weather observations, all AcuRite professional digital weather stations include hygrometers to measure relative humidity. They also measure such conditions as temperature, atmospheric pressure, rain, wind speed, and wind direction. 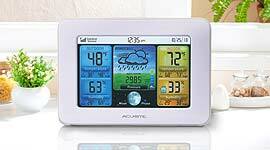 AcuRite’s premier Temperature and Humidity Environment Systems include an indoor or outdoor wireless sensor and AcuRite Access, which captures environmental data, historical records, and trends, and allows for remote monitoring online at MyAcuRite.com or by using the free My AcuRite Apple iOS or Android apps.